Baek Ha Na (left) and Kim Hye Rin. 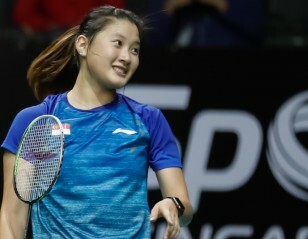 Fast-improving Korean pair Baek Ha Na and Kim Hye Rin upset senior compatriots Jung Kyung Eun and Chang Ye Na on the opening day of the Singapore Open 2019, consolidating their reputation as one of the pairs to watch. Baek and Kim, whose partnership started at the Fuzhou China Open last November after Baek’s then-partner Lee Yu Rim injured herself, have in a short time made ripples on the circuit. 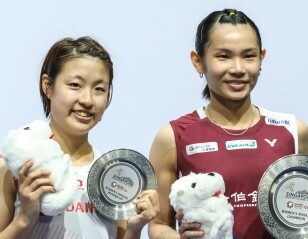 Winners of the Lingshui China Masters and quarterfinalists last week in Malaysia, the young pair made an impact today against their eighth-seeded compatriots. They eked out a second-game win from 13-17 down before surging to victory in the third: 14-21 22-20 21-16. Parupalli Kashyap (India) endured a topsy-turvy third game before clinching his qualifying round match against Yu Igarashi (Japan), 15-21 21-16 22-20. Parupalli led 13-7 in the third before seeing Igarashi overtake him, but hung on and shot ahead at the very end. This was Parupalli’s second qualifying match of the morning session; he had earlier beaten Cheam June Wei (Malaysia) 21-5 14-21 21-17. Men’s doubles top seeds Marcus Fernaldi Gideon and Kevin Sanjaya Sukamuljo, who have struggled with form in recent weeks, were in a spot of bother against Indonesian compatriots Berry Angriawan/Hardianto Hardianto, needing a third game to quell their challenge: 21-18 13-21 21-16. China’s young pairs continued to impress, with Dong Wenjing/Feng Xueying beating Thailand’s Puttita Supajirakul/Sapsiree Taerattanachai (women’s doubles) and He Jiting/Tan Qiang stopping Malaysians Ong Yew Sin/Teo Ee Yi (men’s doubles). Lee Yong Dae (left) and Kim Gi Jung. Kim Gi Jung/Lee Yong Dae (Korea) eased through to the second round beating Mohamad Arif Ab Latif/Nur Mohd Azriyn 21-16 21-13. Singapore’s Loh Kean Yew, winner of the Sirivannavari Thailand Masters, fell in the first qualifying round, to Hong Kong’s Lee Cheuk Yiu, 21-16 21-17. “We felt it was a normal match as we play them in practice. We are a new pair, we got together after my former partner was injured, but we have been able to establish a good understanding on court. We have done well this year, winning the China Masters, so our spirits are quite high,” said Baek Ha Na, following the upset of Chang Ye Na/Jung Kyung Eun.